If you are interested in dental implants but have been told that you are not a candidate due to bone loss from having dentures for too long; this may be true for regular dental implants but there is another solution. Zygomatic dental implants are beneficial to patients that have experienced severe bone loss. These teeth implants significantly reduce the time, expenses, and the number of surgeries compared to regular dental implants. In most cases we are able to give patients same day teeth. Zygomatic dental implants help patients avoid sinus grafts, hip grafts, and prolonged waiting to get traditional dental implants and teeth. A sinus graft is when bone is added to the upper jaw and the maxillary sinuses and the sinus membrane is lifted in order to do so. Often times, patients that experience bone loss have to have this procedure done in order to allow enough bone for the implants to be placed. Even after this procedure is performed, patients sometimes still have to wait up to nine months to have the bone integrate and heal, and then come back to have the dental implants placed. Therefore, patients have to come back for an additional surgery to have the implants placed and still may not have the teeth placed the same day depending on how stable the implants are. Having zygomatic dental implants placed will avoid these two procedures entirely which means the cost of the procedure will decrease. 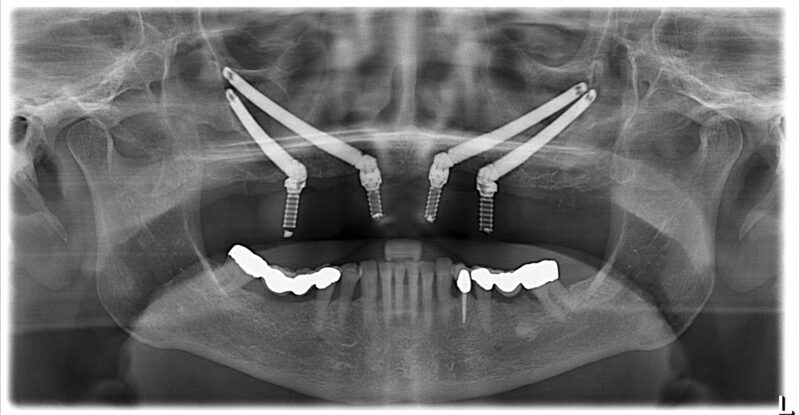 Zygomatic implants anchor partially in the jaw bone and partially in the zygomatic bone and have a high success rate. Depending on the bone quality of the patient, either two zygomatic implants are placed, or four. Having zygomatic tooth implants placed means a patient will have same day teeth delivered on the day of surgery 99% of the time. The cost of zygomatic teeth implants depends on the complexity of the case. Zygomatic implants can cost anywhere from $18,000 to $25,000. This cost includes everything from start to finish. It includes the initial surgery where the zygomatic dental implants are placed as well as the temporary fixed teeth that are delivered on the same day. It also includes all follow up appointments and the delivery of the final tooth implants. If you are considering zygomatic implants get in touch with our Dallas prosthodontist today. We’re here to help you bring your beautiful smile back.